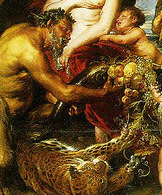 Rubens continues to use his signature composition as this scene lies upon a slanted horizontal plane from right to left. By creating this angle, Rubens was able to add more drama to the image and also more space amongst the figures, creating depth. This is shown by Mars and his avenging Fury, who are situated behind the shield of Minerva. Their positioning creates a deeper composition and a three-dimensional effect. The frontal lighting also creates depth in this image as the strong shadows and bodies define spacing and movements. 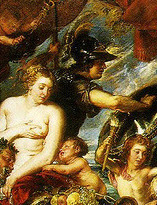 To create this image with a rich narrative and dramatic effect, Rubens uses the most sumptuous colors available. He draws on many elements from nature for just one canvas. This scene is set in a typical woodland which is synonymous with Greek art and behind it rages a tumultuous stormy sky that threatens to destroy the calm. An abundance of rich reds, deep browns, golds and greens are used to create the various textures and fabrics and to define emotions. For Bacchus' followers the artist uses gold ochres for the basket of delights and brown to create shadow, fine lines and intricate detail in the ornaments. Rubens paints deep shadows using black and darker greens upon the fabric to convey its smooth texture. He adds wispy white strokes to create the muslin shift beneath which is see-through and flimsy. Rubens once again uses his signature reds to present passion and fervor in his scenes and upon his subjects, as he randomly paints a red billowing fabric behind a cherub to the top left, between Minerva and Mars and as well as for Mars' cloak. The sensuous fabric can be seen again below Peace as it numerous folds lie upon her lap. Flesh tones are highlighted by a strong, white undercoating to highlight various aspects of the subjects, especially with the maidens and children. Mars and the satyr take on tanned complexions with an array of light browns to display a more rugged, masculine look. Rubens paints the young girl in great detail with bold yellow, brown and gold tones for her dress. He also uses the same technique to paint her white muslin shift underneath the dress to define movement and volume.